Crotalinae, whose members are commonly known as pit vipers (or pitvipers, pit-vipers), is a subfamily of venomous vipers (family Viperidae) characterized by the presence of a heat-sensing pit organ located between the eye and the nostril on either side of the head. One of four families of Viperidae (ITIS 2004; Nilson and Gutberlet 2004), Crotalinae includes such well-known vipers as rattlesnakes and moccasins, among others. Members of this subfamily technically are known as crotalines. There more than 150 species of crotalines, distributed in both the Americas (North, Central, and South America) and in East Asia and Central Asia (Nilson and Gutberlet 2004). There also is one species, Gloydius halys, whose range extends into eastern Europe, north of the Caspian Sea (Nilson and Gutberlet 2004). Crotalines are the only viperids found in the New World. While pit vipers such as rattlesnakes and moccasins are often feared, their venom is reserved for securing prey and for defense, with the rare attacks on humans usually the result of carelessness or aggressive actions on the part of people. However, pit vipers are important ecologically as part of food chains, consuming such small vertebrates, such as mice and lizards, and being consumed by kingsnakes, hawks, and other animals with resistance to the venom. They also provide a valuable service to people through removing agricultural pest species such as rabbits, mice, and rats, as well as contributing to the wonder of nature with their unique forms and behaviors. Nonetheless, the frequent killing of pit vipers, either to remove a perceived threat, or for their skins, or accidentally by automobiles, has contributed to the decline of many populations, along with such causes as pollution and habitat destruction. 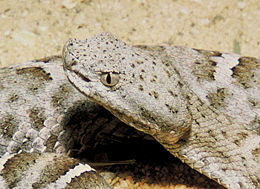 As characteristic of all members of the snake family Viperidae, crotalines have a generally triangular head that is distinct from the neck and have a single pair of long, hollow, venom-injecting fangs that can be folded back against the roof of the mouth, tip inward, when the mouth is closed. The hollow fangs can be used to inject venom, like a hypodermic needle, from glands located towards the rear of the upper jaws. Crotalinae is one of four subfamilies of Viperidae, the others being Viperinae, Causinae, and Azemiopinae (Nilson and Gutverlet 2004; ITIS 2004). The Viperidae comprise about 12 genera and 70 species of true or pitless vipers, such as the puff adders. Azemiopinae has a single genus and species (Azemiops feae) and Causinae has a single genus, Causus, with six species. Depending upon the taxonomic scheme, Crotalinae includes from 18 general (ITIS 2004) to 22 genera (Nilson and Gutberlet 2004), and from 151 species (ITIS 2004) to 174 species (Nilson and Gutberlet 2004). There is a greater number of genera and species in the New World, where they can be found from southern Canada southward through Mexico and Central America to southern South America (McDiarmid et al. 1999). In the Old World, they are found from eastern Europe eastward through Asia to Japan, Taiwan, Indonesia, peninsular India, and Sri Lanka (McDiarmid et al. 1999). Crotalines range in size from the diminutive hump-nosed viper, Hypnale hypnale, that grows to an average of only 30 to 45 centimeters (12 inches to 18 inches) to the bushmaster, Lachesis muta, a species that is known to reach a maximum of 3.65 meters (12 feet) in length—the longest viperid in the world. Crotalines are a versatile group, with members found in tropical and temperate habitats ranging from parched desert (for example, the sidewinder, Crotalus cerastes) to rainforests (for example, the bushmaster, Lachesis muta). They may be either arboreal or terrestrial, and one species is even semi-aquatic: The cottonmouth, Agkistrodon piscivorus. Deciduous forests and grasslands are other habitats frequented. The altitude record is held jointly by Crotalus triseriatus in Mexico and Gloydius strauchi in China, both of which have been found above the treeline at over 4,000 m elevation (Campbell and Lamar 2004). Pit vipers are characterized by the presence of a pit organ. And among vipers, these snakes are also unique in that they have a specialized muscle, called the muscularis pterigoidius glandulae, between the venom gland and the head of the ectopterygoid. Contraction of this muscle, together with that of the m. compressor glandulae, forces venom out of the gland (Campbell and Lamar 2004). Some crotalines also are unique in the presence of a rattle. The pit organ is clearly visible between the eye and the nostril of this New Mexico ridge-nosed rattlesnake, Crotalus willardi obscurus. What makes the crotalines unique is that they all share a common characteristic: A deep pit, or fossa, in the loreal area between the eye and the nostril on either side of the head. These pits are sensitive to infrared radiation, in effect giving the snakes a sixth sense that helps them to find and perhaps even judge the size of the small warm-blooded prey on which they feed (Campbell and Lamar 2004). The pit organ is complex in structure and is similar to, but much more highly evolved than, the thermoreceptive labial pits found in boas and pythons. It is deep and located in a maxillary cavity. The membrane is like an eardrum that divides the pit into two sections of unequal size, with the larger of the two facing forwards and exposed to the environment. The two sections are connected via a narrow tube, or duct, that can be opened or closed by a group of surrounding muscles. By controlling this tube, the snake can balance the air pressure on either side of the membrane (Mehrtens 1987). The membrane has many nerve endings packed with mitochondria. Succinic dehydrogenase, lactic dehydrogenase, adenosine triphosphate, monoamine oxidase, generalized esterases, and acetylcholine esterase have also been found in it (Campbell and Lamar 2004). When prey comes into range, infrared radiation falling onto the membrane allows the snake to determine its direction (Mehrtens 1987). Having one of these organs on either side of the head produces a stereo effect that indicates distance as well as direction. Experiments have shown that, when deprived of their senses of sight and smell, these snakes can strike accurately at moving objects that are less than 0.2°C warmer than the background (Parker and Grandison 1977). It would seem as though the pit organs work like a primitive pair of eyes, although it is not known whether the snake experiences this sense as a visual image or in some other fashion (Bullock and Diecke 1956). Regardless, it is clear that these organs are of great value to a predator that hunts at night (Stidworthy 1974). Unique to the pit viper genera Crotalus and Sistrurus (rattlesnakes) is the rattle at the end of the tail, consisting of a series of horny, hollow segments of skin, loosely attached, that can be vibrated or shaken to make a rattling or buzzing sound. These nested, hollow beads or shells was at one point the scale covering the tip of the tail. In most other snakes, the tail tip, or terminal spine, is cone-shaped, hardly any thicker than the rest of the skin, and is shed along with it at each successive molt. In this case, however, the end-scale, or "button," is much thicker and shaped like a bulb with one or two annular constrictions that prevent it from falling off. Before each molt, a new button will have developed inside the last, one and before the skin is shed, the tip of new button shrinks, thereby loosening the shell of the previous one. Each time the snake sheds its skin, a new rattle segment is added. This process continues so that a succession of molts produces an appendage that consists of a number of interlocking segments that make an audible noise when vibrated. Although a few species of pit vipers are highly active by day, such as Trimeresurus trigonocephalus, a bright green pit viper endemic to Sri Lanka, most are nocturnal, preferring to avoid scorching daytime temperatures and to hunt when their favored prey are also active. The snakes' heat-sensitive pits are also thought to aid in locating cooler areas in which to rest. As ambush predators, crotalines will typically wait patiently somewhere for unsuspecting prey to wander by. At least one species, the arboreal Gloydius shedaoensis of China, is known to select a specific ambush site and return to it every year in time for the spring migration of birds. Studies have indicated that these snakes learn to improve their strike accuracy over time (Shine et al. 2002). Many young crotalines have brightly colored tails that contrast dramatically with the rest of their bodies. Used in a behavior known as caudal luring, the young snakes make worm-like movements with their tails to lure unsuspecting prey within striking distance. Among prey species are small vertebrates, such as rats, mice, lizards, frogs, and birds, which are paralyzed or killed using the venom (Nilson and Gutberlet 2004). Various other vertebrate and invertebrate prey are known, such as locusts. Many temperate species (for example, most rattlesnakes) will congregate in sheltered areas or dens to overwinter (or hibernate), the snakes benefiting from the combined heat. In cool temperatures and while pregnant, vipers also bask on sunny ledges. Some species do not mass together in this way, for example the copperhead, Agkistrodon contortrix, or the Mojave rattlesnake, Crotalus scutulatus. Like most snakes, crotalines keep to themselves and will strike only if cornered or threatened. Smaller snakes are less likely to stand their ground than are larger specimens. Several species of pit vipers, including Agkistrodon piscivorus and Bothriechis schlegelii, give a warning by gaping their mouth to reveal the bright white lining of the mouth (Nilson and Gutberlet 2004). Almost all pit vipers can assume a coiled position as a threat gesture, holding their neck up in an S shape, and many species vibrate their tails when disturbed, which is particularly effective in the case of the rattlesnakes, who produce an amplified sound with their rattle (Nilson and Gutberlet 2004). With few exceptions, crotalines are ovoviviparous; that is, females give birth to live young. Among the oviparous (egg-laying) pit vipers are Lachesis, Calloselasma, and some Trimeresurus species. Egg or neonate attendance has been observed in various pit viper species (Nilson and Gutberlet 2004) and it is believed that all egg-laying crotalines guard their eggs. Brood sizes range from two for very small species, to as many as 86 for the fer-de-lance, Bothrops atrox—a species among the most prolific of all live-bearing snakes. In Agkistrodon and Crotalus, as in some other viper genera, males engage in ritualized fights (Nilson and Gutberlet 2004). In these fights, they approach each other with their heads lifted up and then wrap their bodies around each other and push with the fore bodies, head to head (Nilson and Gutverlet 2004). Agkistrodon Palisot de Beauvois, 1799 3 9 Moccasins North America from the northeastern and central U.S. southward through peninsular Florida and southwestern Texas. In Central America on the Atlantic versant from Tamaulipas and Nuevo León southward to the Yucatan Peninsula, Belize and Guatemala. Along the Pacific coastal plane and lower foothills from Sonora south through Guatemala, El Salvador, Honduras, and Nicaragua to northwestern Costa Rica. Atropoides Werman, 1992 3 2 Jumping pitvipers The mountains of eastern Mexico southeastward on the Atlantic versant and lowlands though Central America to central Panama. On the Pacific versant, they occur in isolated populations in east-central and southern Mexico, Guatemala, El Salvador, Costa Rica, and Panama. Bothriechis Peters, 1859 7 0 Palm-pitvipers Southern Mexico (southeastern Oaxaca and the northern highlands of Chiapas), through Central America to northern South America (Colombia, western Venezuela, Ecuador, and northern Peru. Bothriopsis Peters, 1861 7 2 Forest-pitvipers Eastern Panama and most of northern South America, including the Pacific lowlands of Colombia and Ecuador, the Andes Mountains from Venezuela and Colombia to Bolivia, the Amazon Basin, and the Atlantic forests of Brazil. Bothrops Wagler, 1824 32 11 Lanceheads Northeastern Mexico (Tamaulipas) southward through Central and South America to Argentina; Saint Lucia and Martinique in the Lesser Antilles; Ilha da Queimada Grande off the coast of Brazil. Calloselasma Cope, 1860 1 0 Malayan pitviper Southeast Asia from Thailand to northern Malaysia and Java, Indonesia. Cerrophidion Campbell & Lamar, 1992 3 0 Montane pitvipers Southern Mexico (highlands of Guerrero and southeastern Oaxaca), southward through the highlands of Central America (Guatemala, El Salvador, Honduras, northern Nicaragua, Costa Rica) to western Panama. CrotalusT Linnaeus, 1758 27 42 Rattlesnakes The Americas, from southern Canada to northern Argentina. Deinagkistrodon Gloyd, 1979 1 0 Hundred-pace pitviper Southeast Asia. Gloydius Hoge & Romano-Hoge, 1981 9 9 Russia, east of the Ural Mountains through Siberia, Iran, the Himalayas from Pakistan, India, Nepal and China, Korea, Japan, and the Ryukyu Islands. Hypnale Fitzinger, 1843 3 0 Hump-nosed pit vipers Sri Lanka and India. Lachesis Daudin, 1803 3 1 Bushmasters Central and South America. Ophryacus Cope, 1887 2 0 Mexican horned pitvipers Mexico. Ovophis Burger, 1981 3 4 Mountain pit vipers Nepal and Seven Sisters (Assam) eastward through Myanmar, Cambodia, Thailand, Laos, Vietnam, West Malaysia, Taiwan, Japan (Okinawa), and Indonesia (Sumatra and Borneo). Porthidium Cope, 1871 7 3 Hognose pit vipers Mexico (Colima, Oaxaca and Chiapas on the Pacific side, the Yucatan Peninsula on the Atlantic side) southward through Central America to northern South America (Ecuador in the Pacific lowlands, northern Venezuela in the Atlantic lowlands). Sistrurus Garman, 1883 3 6 Ground rattlesnakes Southeastern Canada, eastern and northwestern U.S., isolated populations in northern and central Mexico. Trimeresurus Lacépède, 1804 35 12 Asian lanceheads Southest Asia from India to southern China and Japan, and the Malay Archipelago to Timor. Tropidolaemus Wagler, 1830 2 0 Temple vipers Southern India and Southeast Asia. Bullock, T.H., and F. P. J. Diecke. 1956. Properties of an infrared receptor. Journal of Physiology 134, 47-87. Campbell, J.A., and W.W. Lamar. 2004. The Venomous Reptiles of the Western Hemisphere. Ithaca, NY: Comstock Publishing Associates. ISBN 0801441412. Integrated Taxonomic Information System (ITIS). 2004. Viperidae Oppel, 1811. ITIS Taxonomic Serial No. : 174294. Retrieved July 26, 2008. McDiarmid, R.W., J.A. Campbell, and T. Touré. 1999. Snake Species of the World: A Taxonomic and Geographic Reference. Herpetologists' League. ISBN 1893777014. Mehrtens, J.M. 1987. Living Snakes of the World in Color. New York: Sterling Publishers. ISBN 080696460X. Nilson, G., and R.L. Gutberlet. 2004. Viperidae. In B. Grzimek, D.G. Kleiman, V. Geist, and M.C. McDade (eds.). Grzimek's Animal Life Encyclopedia. Detroit: Thomson-Gale. ISBN 0787657883. Parker, H.W., and A.G.C. Grandison. 1977. Snakes: A Natural History, 2nd edition. British Museum (Natural History) and Cornell University Press. ISBN 0801410959. Shine, R., L. Sun, M. Kearney, and M. Fitzgerald. 2002. Why do juvenile Chinese pit-vipers (Gloydius shedoaensis) select arboreal ambush sites? Ethology 108: 897-910. Retrieved July 27, 2008. Stidworthy, J. 1974. Snakes of the World. Grosset & Dunlap. ISBN 0448118564. This page was last modified on 12 August 2008, at 21:28.